Angry Dave, Tim and I went out to 3rd Street Promenade in Santa Monica (if you’re a tourist here, it’s one of the “essentials” so to speak) to test out my new Canon S5 IS. Staying within the confines of my apartment photographing teh kitty another 1,000 times just seemed to be shortchanging the capabilities of my new purchase. I was certainly determined to to explore them. That very night. Mind you, my Flickr habits have also been developed with a Canon camera, albeit from the SD series (IXUS in Asia). The little silver rectangular point-and-shoots are convenient. Sure, it’s one of many “tools and accessories” I carry in my purse–just because it happens to fit in there*. But on-the-fly I can whip it out when I see a moment I want to capture. The S5 IS was not bought to carry around in my purse. But I was too curious about the power of a larger digital camera. Sure, small size is convenient but I wanted incremental improvements without the budget, maintenance and skill level required of a DSLR. For now. The DSLR, what with all the lenses I would want to buy and classes I would inevitably want to take, can always come later. I’m leaving for Europe in a week! If anything, I would just want to get rid of the night noise in the pics taken with non-flash, high ISO settings on my trusty, 2-year-old SD500. I also still hadn’t tasted image stabilization, yet. And I’m pretty pleased with how awesome and crisp The Criterion came out (left/above). The dark sky came out pitch black and I don’t see a speckle in the sky. 🙂 What stands out most to me as far as specs on the camera is the 12x optical zoom with a full 8.0 megapixels. Despite the lack of light (that’s what happens when it’s nighttime), I also practiced a bit with the macro settings. You would recognize a macro setting on a Canon by the flower icon. 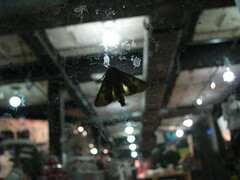 I found a moth on the glass at the Anthropologie entrance. If I had the choice of picking one sale rack in any store at any one time to shop at for clothes for myself, Anthropologie would be it. When we were ready to take a break, we were pleased to find there was a Famima! on 3rd Street. Famima! is my favorite convenience store–and it happens to be Japanese. You can buy curry pockets in their hot food section, J-pop magazines in their “reading” section or even a high-end Papyrus greeting card. Their instant noodles section is unparalleled. Apparently, you can also buy really outrageous bottled drinks. 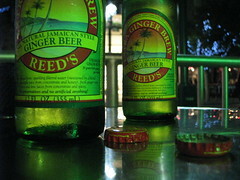 I first tasted Reed’s Ginger Beer at my small group, but this particular day Tim and I had sampled some at Whole Foods before yoga. Later that night when we and Dave were heading to 3rd Street, we were talking about craving some more. Lo and behold, it was being sold at Famima! It’s a tasty (non-alcoholic) brew and it leaves even a little bit of spice in your mouth. It’s spicy and refreshing. 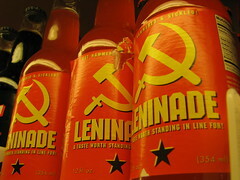 Leninade will have to wait for next time. The vibrant colors on the label–which matched the drink–caught my attention. That is, before I read the tagline: “Get hammered & sickled! The taste worth standing in life for!” Hilarious. And if you don’t already know, I name all my prized possessions. I don’t have a good reason why–except that it personalizes things for me and I willingly grow a sort of attachment to things so I take good care of them. My new camera, I named Stefan, and he is awesome. He will be a valuable travel companion. I also wanted to ask anybody during my last week here if you would recommend any sort of filters to take along to London, The Amalfi Coast and Munich. Recommendations as to that, sights to see and/or misc. travel advice in those areas would be greatly appreciated! You can also view my entire Flickr set from my 3rd St. Promenade outing. * I’ve had two shoulder surgeries this year. The obvious one was the arthroscopic labrum repair, but the first one removed a lump from my other shoulder. It was a lipoma but was also noted to have inflammation cells, meaning the mass had become irritated over time. My surgeon asked me if I played any sort of sports that required a piece of equipment on my shoulder. I said no and thought of anything that could have caused that irritation–and the only thing I came up with was my purse being carried on that shoulder most of the time since I am “extremely” right-handed (or right-appendaged). So what’s been concluded from that (and others’ personal opinions) is that my purse is exceedingly heavy. The camera doesn’t help much, I’m sure. 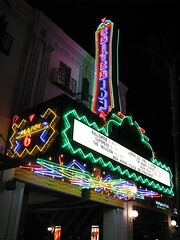 This entry was posted in In the life, Nerdism, Santa Monica, Travel. Bookmark the permalink.